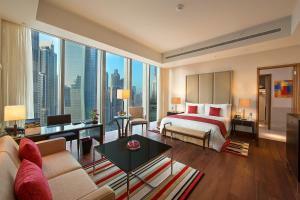 The Oberoi, Dubai is a contemporary luxury hotel in Dubai, whose design embodies height, light and space. We offer uninterrupted views of the iconic Burj Khalifa from our prime location amongst hotels in the UAE, being just minutes from Dubai Mall and Dubai International Financial Centre,that can be easily reached with free shuttle bus that the hotel operates. 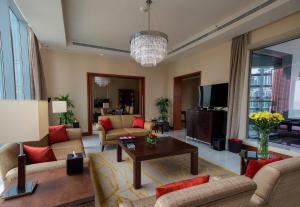 The 252 spacious, luxurious and elegantly appointed rooms and suites convey a warm and welcoming ambience. Timber floors, rich fabrics, hand-tufted rugs and specially commissioned artwork further accentuate the elegance of the rooms. 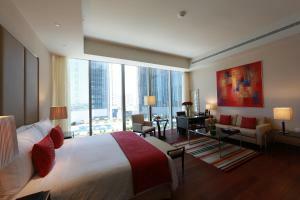 Featuring elegant furnishings and contemporary artwork, the accommodations at The Oberoi, Dubai come with a balcony or floor-to-ceiling windows. 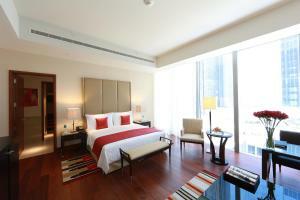 Each room includes a flat-screen satellite TV, a minibar,tea/coffee making facilities,bathtub and a separate shower. Dinning options include award winning restaurants with an all day dinning restaurant serving different world cuisines.In addition guests can try our speciality Indian restaurant: Ananta and a lobby bar where you can unwind for a drink. For a fee, you can access the spa which features a wide range of massages and beauty treatments. Yoga classes can be arranged upon request. 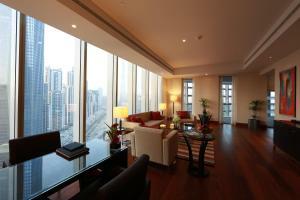 You can drive to Dubai International Financial Centre in 20 minutes. 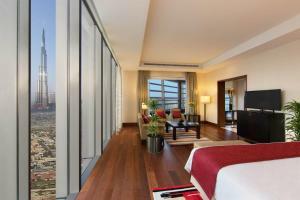 Dubai International Airport is 18 km from The Oberoi, Dubai. Free valet parking is possible. It provides complimentary shuttle transfers to Dubai Mall, Business Bay, Dubai International Financial Centre and Emaar Square. Guests are required to show a photo identification and credit card upon check-in. Please note that all Special Requests are subject to availability and additional charges may apply. 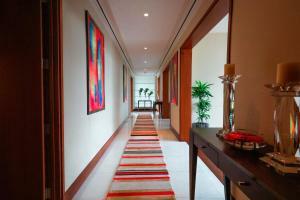 Please inform The Oberoi Dubai in advance of your expected arrival time. You can use the Special Requests box when booking, or contact the property directly with the contact details provided in your confirmation. Featuring floor-to-ceiling windows with views of the city, this elegant room offers a flat-screen satellite TV, an iPad docking station, a minibar and a Nespresso machine. Other facilities include free Wi-Fi and a personalised butler service. The private bathroom is fitted with a bathtub and free toiletries. Featuring floor-to-ceiling windows with views of the swimming pool, this elegant room offers free wireless internet, a flat-screen satellite TV, minibar and a Nespresso machine. It includes a personalized butler service. The private bathroom is fitted with a separate bathtub. 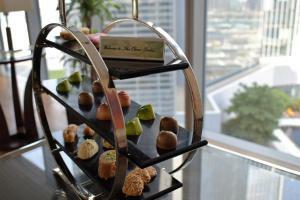 Featuring floor-to-ceiling windows with views over Burj Khalifa, this elegant room is furnished with abstract artwork and offers a flat-screen satellite TV, minibar and tea/coffee making facilities. Other facilities include free Wi-Fi and a personalised butler service. The private bathroom is fitted with a bath, shower and free toiletries. Featuring a private balcony overlooking Burj Khalifa, this elegant suite offers a dining area and a spacious living room with a flat-screen satellite TV. It includes free Wi-Fi, a minibar, tea/coffee making facilities and a personalised butler service. The private bathroom is fitted with a bath, shower and free toiletries. 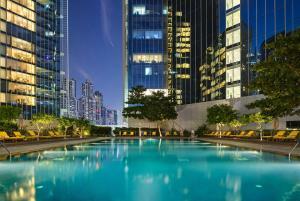 Complimentary airport drop and pick up from Dubai international airport is available. 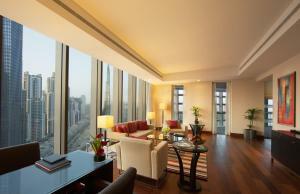 This spacious, elegant suite features a bedroom and a living room with floor-to-ceiling windows overlooking Burj Khalifa. 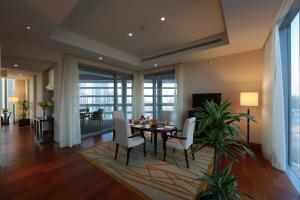 It includes a private balcony, dining area and a flat-screen satellite TV. 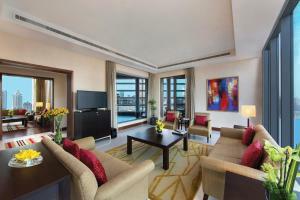 The suite also has free Wi-Fi, a minibar, tea/coffee making facilities and a personalised butler service. 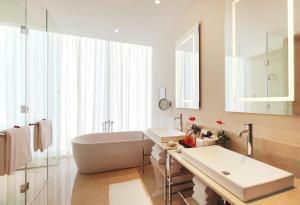 The private bathroom is fitted with a bath, shower and free toiletries. Located on the top floors of the hotel, the Presidential Suites feature a grand master bedroom with a study, a spacious living room that extends onto a balcony with a plunge pool, and a dining room with a fully equipped kitchenette. The Two-Bedroom Suites include one king size bedroom, one twin bedroom. 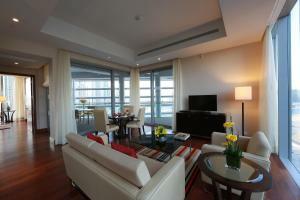 These suites also have a richly furnished living room, a dining room, a bathroom and a separate powder room. The Three-Bedroom Suites include one king size bedroom, one twin bedroom, and a third bedroom with either a king or twin beds. 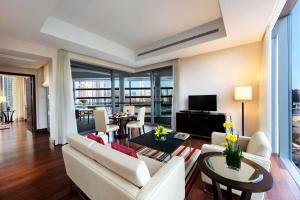 These suites also have a richly furnished living room, a dining room, a bathroom and a separate powder room.